Michelle Obama looked stunning in a series of sparkling suits. Source: Getty. 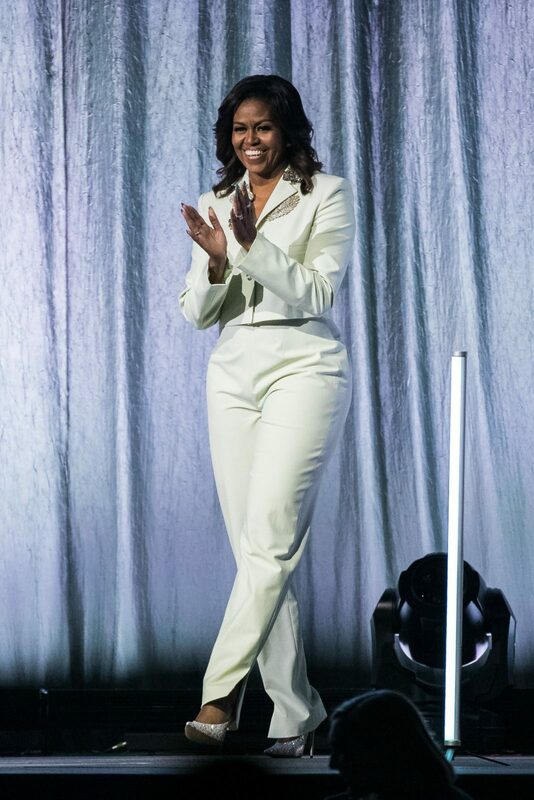 Michelle Obama took a step back to the 1970s this week as she donned a series of bold and sparkling suits for the promotion of her book in Copenhagen, Stockholm and finally Norway. The 55-year-old was full of confidence as she took to the stage in Norway’s capital of Oslo on Thursday to speak about Becoming: An Intimate Conversation With Michelle Obama, which was released last year. Michelle dazzled in black tailored pants and a jacket, complete with crystal embellishments and a green satin sash, with the whole outfit reportedly worth $6,000. Barack Obama’s wife smiled broadly as she fronted crowds, standing tall in black heels, with her brunette locks falling gracefully to her shoulders. The former lawyer has been touring across the world promoting her book and sharing intimate details on her life in and out of the spotlight. Just the day before, she made an incredible appearance in Sweden’s Stockholm, this time opting for a tightly-fitted cream suit with more jewel embellishments across the jacket. Adding more sparkle to the eye-catching outfit, she then coupled it with silver glittery stilettos and flashed a beaming smile to the crowd. Michelle Obama speaks during her event in Stockholm, Sweden. Source: Getty. 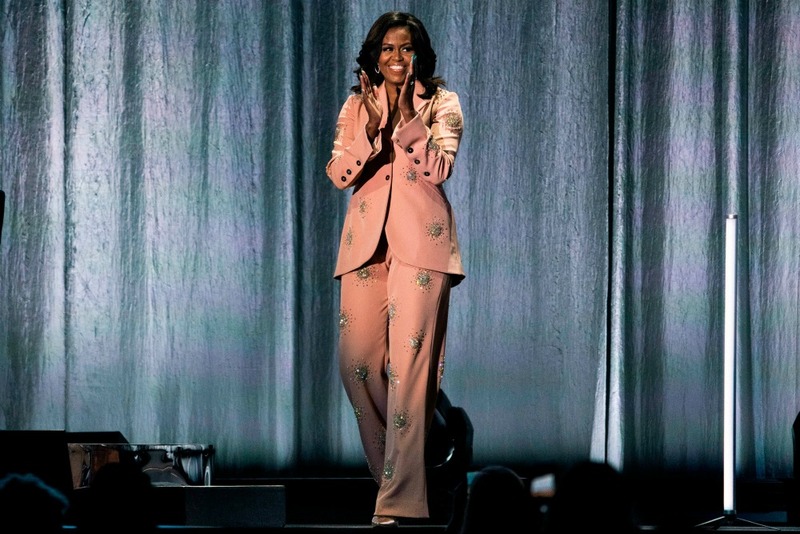 And one day before that, kicking off her series of amazing suits, Michelle chose a truly ’70s-inspired salmon pink suit with jewels scattered right across the jacket and trousers, as she spoke to fans in Copenhagen. Becoming: An Intimate Conversation With Michelle Obama gives readers an insight into her experiences, going right back to her childhood growing up in the south side of Chicago to her years balancing work and motherhood and her time as America’s first lady. The former first lady looked amazing in salmon pink. Source: Getty. According to local Norwegian news outlet ABC Nyheter, Michelle took the opportunity in Oslo to discuss xenophobia, the dislike of or prejudice against people from other countries, along with the importance of education. “Change does not come from the castle or from the White House. It happens between people every single day,” she reportedly said at the event. 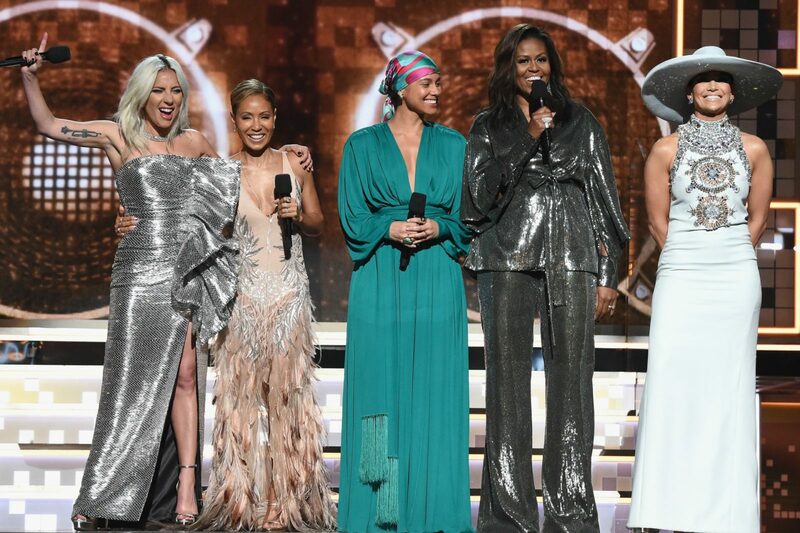 The mother-of-two is certainly no stranger to bold outfits, completely stealing the show at the 2019 Grammy Awards when she surprised the crowd by stepping out on stage in a wild silver outfit to deliver a powerful speech. The former first lady looked sensational in the standout sparkly ensemble which included a silver blouse with billow sleeves and matching wide-leg pants. Michelle finished off the striking look with simple silver accessories and wore her brunette locks out in soft waves. During the ceremony she made a surprise appearance onstage alongside Lady Gaga, Jada Pinkett Smith, Jennifer Lopez and host Alicia Keys to discuss why music is so important, and the impact it has had on her own life. “From the Motown records I wore out on the south side to the ‘who run the world’ songs that fuelled me through this last decade, music has always helped me tell my story, and I know that’s true for everybody here,” Michelle said, according to People, as the room erupted in applause. Are you a fan of Michelle Obama? What do you think of her outfit choice?